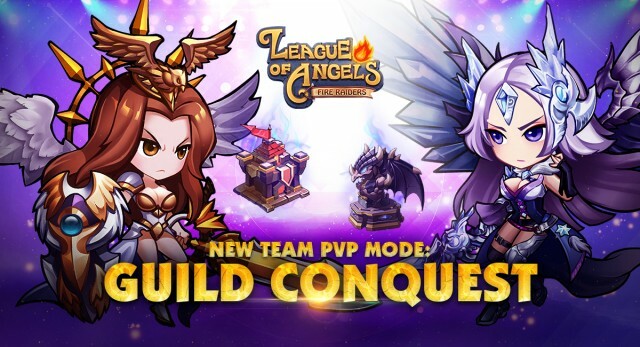 A new cross-server PvP mode – Guild Conquest – is coming in Update 3.7 for League of Angels - Fire Raiders, the popular free to play strategy RPG on mobile. 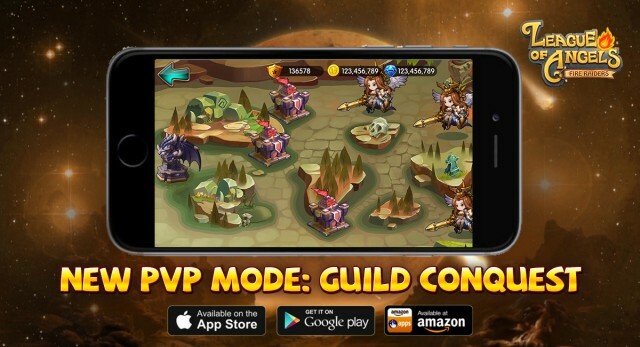 Players can rally their guilds to take on rival guilds for great rewards and the ultimate bragging rights. Here we lift the mysterious veil of Guild Conquest. Guild Conquest is accessible from the new Guild Conquest building within the Guild interface. It is available to players level 65 and above and guilds level 30 and above. Guild Conquest is divided into 6 phases. 1. Sign-up Phase: Players create their teams and deploy them to defend Strongholds. 2. Matching Phase: The system will match opponents (cross-server) according to Guild sign ups. 3. Preparation Phase: Players can adjust their defending team formations, but cannot add teams, replace Angels/Heroes, or disband teams during prep. 4. Combat Phase: Attack the oppossing guild’s raid boss-like wardens, strongholds, and guardians. The final outcome of Guild Conquest is determined by points earned in these battles. Players can also earn Merits during battle that can be used to purchase items in the new Guild Conquest Shop. 6. Rest Period: Take a breather and prepare for the next Guild Conqest! Guild Conquest is designed like a strategy RPG version of the popular MOBA genre. The intricacies of combat in Guild Conquest is detailed below. 1. Defeat the Dragon Warden: This is the first line of defense and must be defeated first to move on in Guild Conquest. Dragon Wardens are like raid bosses and will require the combined efforts of your guild to take down. 2. Defeat the Strongholds: Once the Dragon Warden is defeated, the enemy’s Strongholds are now open to attack. Strongholds will be guarded by the enemies’ hero teams. Defeat them all to defeat the Stronghold. 3. Defeat the Guardian Angels: The last line of defense for a guild, there is a Guardian Angel at the end of each lane. Once a Stronghold has been defeated, the Guardian Angel in that lane becomes open to attack. Defeating the Guardian Angel will reward a lot of points. Guilds can level up their Angels through donations to make them stronger. What you guys think about this new and unique Guild PvP mode? You can know more on the official Facebook fan page, and if you play League of Angels - Fire Raiders, please prepare for the update by binding game progress to GTArcade/Facebook/Google+/Game account now! League of Angels - Fire Raiders’ team will keep players updated on when version 3.7 will be available on Google Play and the App Store.